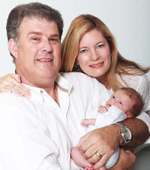 We ended up at Fembryo after a lot of heartache and desperate to have a baby of our own. From the first time we met Dr. Botha at our first consultation to the last time we walked out of the hospital, less than 4 months later, we not only felt like patients, we felt like friends. 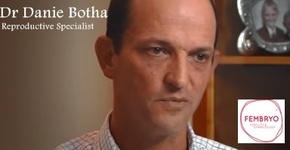 We all know that the path of infertility is a hard path to walk on, but Dr. Botha and his team made this path as bareable and comforting as possible. Our third artificial insemination at the Fertility Unit worked. Even when the first two insemination at the Unit did not work, we were supported not only by Dr. Botha but by the entire Fembryo team. What meant even more is that they did not forget about us after finding out we were pregnant. They phoned and/or e-mailed us on a regular basis asking how the pregnancy was going. Even when our baby was born we were phoned and congratulated. When we look into the eyes of our baby we thank God every day for Fembryo and all it's staff. You guys truly were a blessing in our lives.